Happy Friday as #ThatBusinessShow wraps up week 18 on 1250WHNZ. Having this platform to talk with and help support the business community within Tampa has been a very rewarding part of my day this past year and something I look forward to each and every morning. Be sure to visit http://www.tampabayradio.com for more information and connect with me on all the social media sites including Twitter, Facebook and LinkedIn. 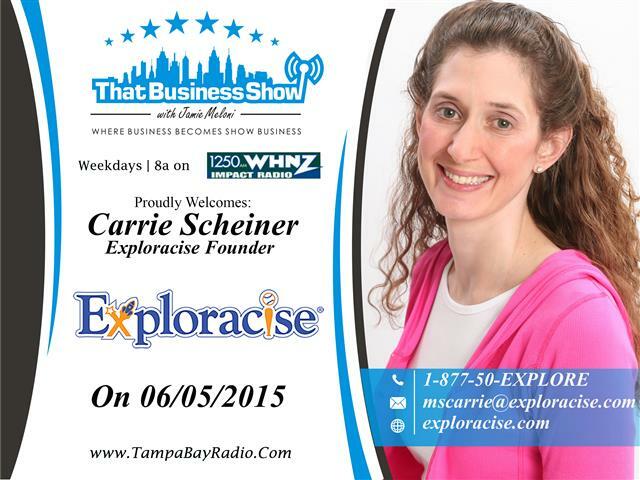 The show opened today with Carrie Scheiner, Founder of Exploracise. Launched in 2014, Carrie’s program incorporates education and physical exercise in fun to do activities designed for children in pre-school. She has developed 5 products with an educational and physical component to each one and visits schools each week and engages with children to enhance their learning environment through these products and associated games. Inspired to launch this business by her own children, Carrie has grown her business into an award winning program and has launched an online program called the Exploracise University Online Program which is the next step in her goal to help children around the Country enjoy learning through math and these fun-filled activities. Carrie’s lifelong love of helping others carries over into her business and her goal is to create a community of passionate families and educators that encourage children everywhere to embrace learning along with a healthy lifestyle for a rewarding and successful life. Carrie is currently looking for educators to assist her in her program so if you love children and education as much as Carrie, you need to contact her for more information and visit http://www.exploracise.com for more information on her program and products and the online program as well as many other educational resources for children and parents. Ms. Carrie as her students know her by can also be reached at 1-877-50-EXPLORE, and email at mscarrie@exploracise.com! 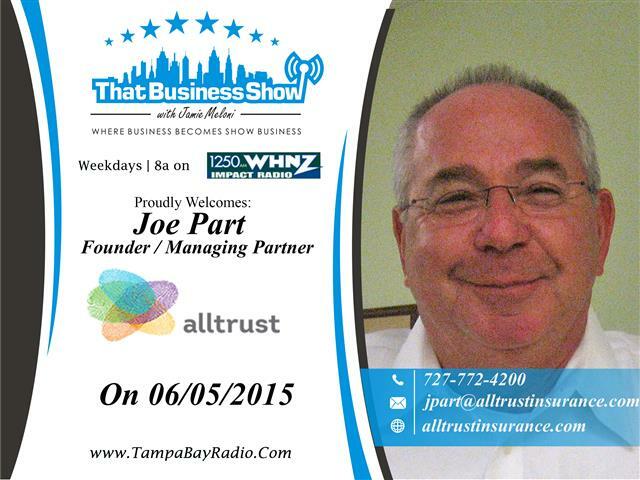 On the 2nd half of the show, I spoke with the charismatic and entertaining Joe Part, Founder of Alltrust Insurance and currently the managing partner. Joe founded this company in 1994 after working in the insurance industry as a broker and since then has grown the company tremendously which now serves over 400 employer groups with a staff of 30 trained and licensed professionals. AllTrust Insurance has a wide variety of products and services from employee benefits to HR and more and we touched on a couple of those but Joe, as he warned, likes to take things a bit off course and the segment was highly entertaining and funny as he engages Carrie in a conversation on his appearance and his attractability which left Carrie at a loss for words but was a nice break from the norm of business talk. Joe also touched on his company’s culture which is very tightly connected inside the company and his and AllTrust’s community involvement ranging from the Crisis Center for women that are victims of sexual assault to the Moffitt Cancer Center where he serves on the Advanced Prostate Cancer Board. With offices in Tarpon Springs, Tallahassee, Sarasota, Lakeland and now Orlando, AllTrust is committed to helping employers with their business needs. Learn more at http://www.alltrustinsurance.com and call 1-888-563-7278 for more information on their services for employers.